Spectacular views of Honolulu/ Waikiki/Diamond Head are seen from this beachfront home, on Oahu's south shore. In the evening, you can view both the lights of the city and the stars in the sky with equal brightness from your private deck. Spectacular sunrises and sunsets are seen from our deck, near the water's edge. Located in the village of Ewa Beach. The downstairs 3 BR, 2 BA house is called The Ewa Moon. The master bedroom with attached bathroom has a Queen bed; the Blue Room has a Queen bed, and the Hawaiian room has 2 twin beds. This house with vintage Hawaiian decor and surrounding area have the feel of Old Hawaii and appear to have stood still in time. Tall coconut trees sway in the breeze, as you stroll along the beach. Local fisherman cast off the shoreline and spear fish in the reef. 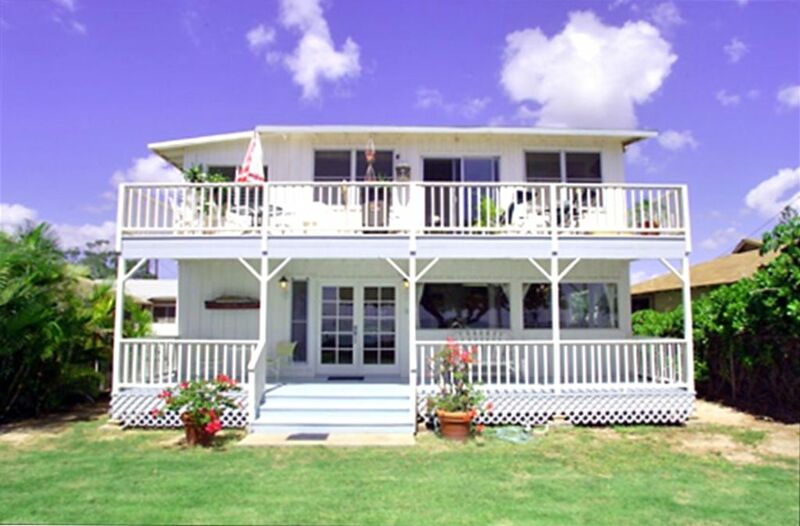 The upstairs Hula Moon 3 BR, 2 BA has a large open balcony with expansive view of the ocean. A custom German made motorized retractable awning graces the large upstairs balcony. Each unit rented separately or together for large groups. Each level is 1250 SF. Total 2500 SF. Each unit accommodates maximum of 6 people, including children and infants. Whole house accommodates max of 12 people. Separate Blue Moon house on same property, not beachfront, is also available for Vacation rental. It is 3 bedrooms, 1 bath and accommodates up to 6 people (including adults, children and infants). With this additional house, the capacity of this property is up to 18 people total (including adults, children and infants). See VRBO #446725 to view the Blue Moon house. With private entrance to the second story, the 'Hula Moon' has great views. Guests of the second floor Hula Moon are allowed beach access. The lawn, beach deck and picnic areas are reserved for guests of the first floor Ewa Moon. Free highspeed WiFi internet. Free unlimited long distance phone to the US/Canada/Neighbor Islands. Free uncovered parking for one car on site. Just 5 minutes away is Starbucks Coffee; 2 minutes away is a new Safeway; Foodland grocery is 3 minutes away. Closer grocery shopping at Longs Drugs is less than a minute away. In our town, we have several small restaurants with ethnic variety, as well as the usual Fast Food places. 15 minutes away is the popular Waikele Outlet Shopping Center, frequented by tourists from all over the world. The best beginning surfing on Oahu is found here. You can fish from your front yard (equipment not provided), sun on your beach deck, or have a picnic beneath your shade tree. You are three to five minutes from six golf courses, including the Hawaii Prince Golf Course! State of the art Water Park with flo rider is 7 miles away. The Kapolei 12 Plex Theatre is 6 miles away. This getaway is ideal if you want to avoid mega resorts and tourist ridden areas. On the Ewa Beachfront with expansive ocean view and a stunning Diamond Head view with Honolulu and Waikiki in the distance, and a night time view of both the City Lights and the stars above, this is an ideal setting to enjoy nature and Hawaii. Monk seals and turtles swim by, and whales can be seen migrating in the fall and spring. The two levels of the beachfront house allow for six people to enjoy each level for a total of 12. The Blue Moon, on the streetside of the same property sleeps six. So you can have a group of 18 all together. This is unique in Ewa Beach. Downstairs Ewa Moon has 2 bathrooms, each with a shower. Upstairs Hula Moon has 2 bathrooms. One has a full tub and the other a shower. This house is right on the beach! Walk through the lawn, step over the beach wall, and you are on sand! Bath towels provided. Please provide your own beach towels. Free highspeed wireless (WiFi)internet. Bring your laptop. Ewa Moon has use of lawn and deck area. Hula Moon has access through the lawn to beach, but not use of lawn or deck area unless both levels are rented by the same group. Veranda for downstairs. Large open balcony with retractable awning for upstairs. Turtle and monk seal watching from your Deck at this beach house. Water Park and cinema theatres at Kapolei, 6 Golf Courses within 4 miles, outlet Shopping nearby at Waikele and Kapolei, Swimming & Diving, 5 man made lagoons for easy swimming at the Ihi' Lani Resort and the Disney Resort, Au'lani 12 minutes away, Pearl Harbor Arizona memorial 25 minutes away, White Plains beach with the best novice long boarding on Oahu and free parking, 10 minutes away. Luaus at Germaine's and Paradise Cove 10 minutes away. Polynesian Cultural Center and luau 40 minutes away. Waikiki Beach 40 minutes away.